STEM is one of those edu-acronyms that gets tossed out at large conferences, as models for new innovative schools, and a “catch all” for science and math stuff lately, yet it still seems to mystify many teachers. An informal poll of teachers in my district revealed that while a good portion of them knew that it stood for Science, Technology, Engineering, and Math, many of them weren’t sure what it meant beyond students taking a more project based approach to science and math. Other teachers I’ve talked with around the state have a similar understanding, but a growing number of them have begun to understand that STEM is really about flipping the traditional classroom structure, from teacher-centered learning to more inquiry, problem solving, and exploratory learning. Yes, science, technology, and math play an important role in that, but language and communication skills are also are an important part of the STEM classroom; students must be able to effectively communicate with small groups, whole class, and project-groups both in face to face and online settings. 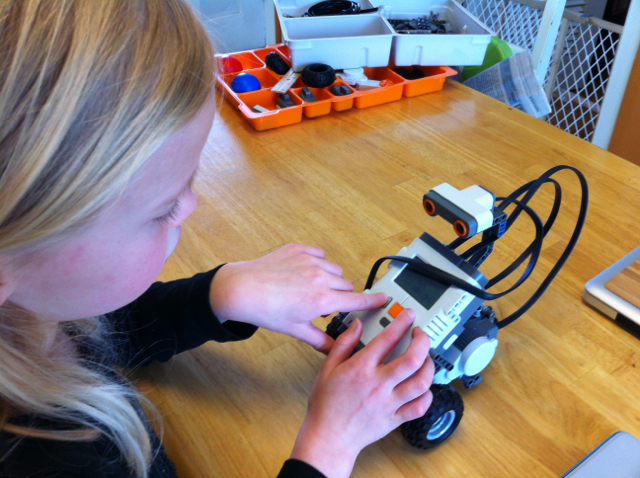 My daughter programming the LEGO Mindstorm Robot with her very own special program. She was pretty proud. The stereotypical view of the STEM classroom is that of a group of students busily working around a robot (LEGO or otherwise) or some other highly technical piece of equipment, but that’s not always the case. Simply maintaining a classroom environment that focuses on hands on learning, student exploration, and experiential learning activities hits upon many of the STEM tenets. During a blogger’s round table I was fortunate to be a part of courtesy of LEGO Education in St. Louis last November, I shared a very sad story about a group of middle school science teachers down in Loxahatchee, Florida that had decided they were no longer going to allow students to do hands-on labs. Their justification was that labs are messy, introduce lots of opportunity for student failure, and don’t actually help move student data in a positive direction. To hell with data, I say! What about the powerful hands-on experience of failure; accepting it, learning to get past it, and most importantly, learning how to succeed afterwards. That’s not going to show in data, it’s not going to show in high-stakes testing, and yet these science teachers were claiming that’s all they were focused on now, the data. I brought up the article to make a point during the discussion I was having with Audrey Watters, David Banks, Eric Brunsell, and folks from both LEGO Education and National Instruments. As excited as people are about hands-on exploratory learning that will truly better prepare students for the real world, there exists a HUGE morass of reasons why schools aren’t willing to step away from the high-stakes testing prep model. Fear is the biggest of those reasons; fear of loss of stature, fear of falling test scores, and fear of the “unknown”. So how can you begin to convince teachers in this mindset that the STEM approach might actually help students, address fear in a positive way, and allow us to explore education that doesn’t directly address high stakes testing? Audrey had a great post right after the STEM Summit that talks about how we need to start putting responsibility back in the hands of the student. When we hand students worksheets, bubble tests, clickers, and other prescribed forms of “learning”, there’s no ownership, and certainly no sense of the type of responsibility we want students to have with their learning. We don’t have to return responsibility just through science and math though, we can do it in many ways, especially through some public narration, curation, and sharing of their learning experiences. Stephen Heppel understands this all too well. I was able to see one of his masterfully crafted student showcases in which the students were presenting high-level collaborative projects that most adults aren’t capable of achieving. Student powered mobile game development, CNC programming, robotics, and more were all on display last summer in St. Clair County, Michigan at “Be Very Afraid Extra”. I don’t share this from the standpoint that these students were capable of working with applications and devices that adults couldn’t manage, but rather these students were working together in a way that most teachers (and often parents) don’t allow students to do, because they feel like students won’t be able to handle the responsibility, or don’t possess the skills to tackle large problems that the STEM model heralds. Unfortunately, that becomes a self fulfilling prophecy if teachers don’t ever give students the chance to tackle large problems on their own, fail, and then provide the support their learners need to overcome that failure, adjust course, and continue on. Why all of this background information on a topic that has been around for awhile? It wasn’t until earlier this month when I really started to put all of these theories to the test. My 6 year old daughter and I built a LEGO Mindstorm Robot that LEGO Education was very nice enough to send me, and together we experienced the STEM model first hand. In fact, we made a time lapse of the unpacking, robot construction, and subsequent “play” after our build was done. You can see the time lapse below, or click here to view it on Vimeo. Besides the fact that I got a chance to use one of my new favorite apps, Frameography, to create the time lapse with my iPad, I was able to witness firsthand what many of the teachers on the discussion panels at the LEGO Summit were expressing when they talked passionately about students using all sorts of skills to effectively complete problem-based projects. Because LEGO build diagrams contain only images and no text, my daughter and I had to stop, tear down, and rebuild quite a few smaller pieces and structures of our robot during the overall build due to some of our mistakes. While the images were very helpful, there were times when our excitement to build the robot caused us to rush, make mistakes, and use incorrect parts. This allowed us the opportunity to better understand the construction of the device, and why certain parts were assembled in a given fashion. It also taught us that slowing down a bit can be beneficial at times. At one point we were presented with a challenge of which size “rods” to use. Before realizing that the pieces in the manual were drawn life size so we could easily match the correct size rods to the designs, we were trying to come up with our own way of sorting them on length, good practice for arranging, sorting, and curating the tools we had available to us. My daughter and I had a great time trying to figure out which unit of measurement LEGO was using, even if we didn't figure it out. When we realized that we could easily use the manual to determine which size rods we needed, we were then presented with another learning opportunity. Each rod was marked with a number. My daughter cheerfully suggested that the numbers were in inches, which I immediately knew was incorrect as a piece no bigger than three or four inches was marked as a 7. I told her I had doubts, and then asked her what we could do to make sure. “A ruler, daddy!” was her reply, so we grabbed a tape measure from the kitchen junk drawer and started measuring. It wasn’t inches, and after some thought, we found a metric ruler, and discovered that it wasn’t in centimeters either. We were puzzled, but we enjoyed the fact we had stumbled across a minor mystery, and had come up with some reasonable ways we could tackle it, even if we didn’t discover what those numbers meant (if you know, please share, my daughter and I would love to know!). By the time the robot was finished, my daughter and I had not only been able to practice a heap of communication and teamwork skills (we had to decide who would build which part, take turns being the “part collector” and the “builder”, etc. ), but we had managed to work in several basic mathematics and science concepts. The best part of the build were the little programming tutorials and examples that LEGO builds into the process. With the addition of each new sensor or motor, the building instructions give you a simple 5 step program that you can input using the robot’s NXT “brick” (the big box with the display and the orange button). We were only able to play with the motors and the light sensor during our initial build, but it was very easy, and my 6 year old figured it out after just a few minutes. It reminded me of programming the old Logo turtle application, only the feedback was much more visceral in that we got to see our robot move around in a physical space, bumping into things, rather than a few pixels on a screen. It was so simple to program that after adding the light sensor my daughter wanted to create her own program for the robot, which I gladly let her do. She came up with her own simple program that controlled the robot’s movement forward by waving her hand in front of the motion sensor. In fact she wanted to share the story of it being built, which you can view below, or watch here over on Vimeo. And that’s when it clicked for me! I finally understood what STEM was all about! It wasn’t from listening to other teachers laud the instructional methods behind STEM education, it wasn’t a fancy conference that showcased innovative uses of technology, it was from me and my daughter, tackling a project by ourselves. To be fair, the great conferences and conversations with teachers prepped me for the moment, nudging me towards a shared experience of struggling and success with my daughter, something that all teachers are capable of achieving with their students. What really pushed me over the tipping point was the shared learning and exploration that I had with my daughter (lots of great discussion and scaffolding of learning concepts happened during this), followed by her independent exploration of the programming tools. It took the both of us learning together to introduce her to certain concepts, and become familiar with certain tools, followed by her own exploratory programming and play to complete the full learning experience not just for her, but for both of us. While my daughter was learning what amazing things she could make her robot do, I was learning how the idea of STEM education helps the learning environment model many real-world project oriented tasks. Now all I need to do is figure out how to help the teachers in my district have their own “robot building” experience. Previous:Come Write Poetry With Me This April! Next:The Post in Which I Remember Google Earth is Awesome! Great article, it really does help to explain STEM well. It is always something I have had a hard time explaining. 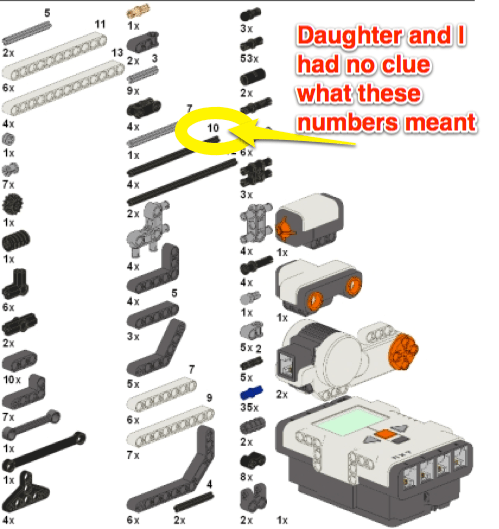 As for the question about the number next to the pieces in the Lego directions, it is the number of the studs or bumps on a regular Lego piece. For example, a basic rectangle piece is 4 x 2. So one of the rods that it labeled a “10” is ten LEGO studs long? That is amazingly helpful, thanks, will have to let my daughter know this weekend when we start to build our next robot. Thanks! A great article! Michael already gave you the answer on the axle lengths and you probably figured out the numbers on the beams were the number of holes. LEGO parts are great for engineering – they put a lot of thought into making things work together. You can find articles on LEGO geometry online that are quite helpful for learning and teaching. For example, to properly connect two beams with a cross-brace you need to use the Pythagorean Theorem if you want to avoid stressing (bending) parts. Don’t even get me started on all you can learn about force, speed, torque, gear trains, etc.! I’m not a teacher, but I have coached some FIRST LEGO League teams over the years at both the elementary and middle school level and even taught an after-school robotics course in the middle school. You can get involved yourself and make a difference for some kids! Thanks for letting me in on the little Pythagorean secret for optimal strength and low stress. I could see how a math or science teacher could have a field day with a few of these robotics kits. There is really a lot more there, too. The width of a 1 x 1 stud brick is 1 LEGO unit or 1L. The height, however, is 1.2L which leads to interesting math. The height of a plate (the flat bricks with studs are called plates, not bricks) is .4L so three plates are as high as one brick. The bricks with holes are called “Technic bricks”. They have holes that are 1L apart (just like the beams), but they can be stacked like regular bricks. So vertically, their holes are 1.2L apart. This leads to fun calculations like how can you build a stack of Technic bricks and then brace them vertically with a beam? There are many combinations but one example would be to use four Technic bricks with one additional plate in-between. Then you can use a 5-hole beam to brace the top and bottom bricks vertically. The distance between the top hole and bottom hole is 3 * 1.2L = 3.6L so when you add .4 you get 4L which is the distance between the first and last holes in the beam. The calculations become more complex when you use a beam to brace a stack of bricks diagonally (back to the Pythagorean Theorem but with fractions and issues with tolerance levels). Fun stuff to teach and easy to “get” because they can manipulate it physically. Thanks for sharing. Our homeschool group just purchased our first two Lego Robotics sets. Many of us use a philosophy based on Charlotte Mason, a teacher in the late 1800’s. It’s great to know this sets will fit right in! I echo Angelo’s comment – Look into starting one or more FLL teams with your homeschool group! FLL is for ages 9-14 (roughly 4th-8th grade). Interesting. I looked up Charlotte Mason’s philosophy of education and it looks like there’s a lot of it in many schools that I’ve worked in. The idea of personal learner narration, and the liberal notion of immersing the learner in a number of fine arts and nature is something I’m cool with. Thanks for introducing me to another educational theorist. I really appreciated your first hand “discovery” of STEM. As a special educator and English teacher, STEM was always a bit of a mystery to me, too. I really appreciated your explanation of your thought process through this experience. I recently attended a conference related to Common Core and was pleased to see the explanation and integration of STEM in the curriculum. It helped me understand the problem solving aspects that are incorporated into STEM. I believe that this is a very powerful skill that students will need to be successful in the world. A Well-implemented STEM currriculum could be a major benefit to our students. I look forward to seeing how Common Core and my school district implement these skills. I see the Common Core Standards, STEM, Challenge Based Learning, and a host of other collaborative instructional and learning strategies as being heavily intertwined. The Common Core will finally give us the framework we need to justify truly effect collaborative education within classrooms. THe challenge will be to maintain the important independent learning that balances out the rest of the learning experience.